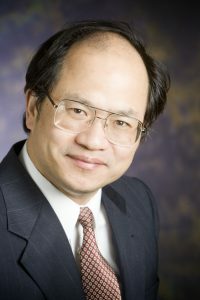 Jian-Ming Jin is Y. T. Lo Chair Professor in Electrical and Computer Engineering and Director of the Electromagnetics Laboratory and Center for Computational Electromagnetics at the University of Illinois at Urbana-Champaign. He has authored and co-authored over 275 papers in refereed journals and over 20 book chapters. He has also authored The Finite Element Method in Electromagnetics, Electromagnetic Analysis and Design in Magnetic Resonance Imaging, and Theory and Computation of Electromagnetic Fields, co-authored Computation of Special Functions, Finite Element Analysis of Antennas and Arrays, and Fast and Efficient Algorithms in Computational Electromagnetics. His name often appeared in the University of Illinois’s List of Excellent Instructors. He was elected by ISI among world’s most cited authors in 2002. He is a Fellow of IEEE, Applied Computational Electromagnetics Society (ACES), and Electromagnetics Academy. Recently, he received the 2014 ACES Technical Achievement Award, 2015 IEEE APS Chen-To Tai Distinguished Educator Award, 2016 ACES Computational Electromagnetics Award, and 2017 IEEE APS Harrington-Mittra Computational Electromagnetics Award. As computational methods for solving Maxwell’s equations become mature, the time has come to tackle much more challenging multiphysics problems, which have a great range of applications in sciences and technologies. In this presentation, we will use four examples to illustrate the nature and modeling of multiphysics problems. The first example concerns the heat problem in integrated circuits due to electromagnetic dissipated power, which requires an electrical-thermal co-simulation. The second example considers modeling of monolithic microwave integrated circuits, which consist of both distributive and lumped circuit components. The third is the simulation of vacuum electronic devices using the particle-in-cell method, which solves Maxwell’s equations and particle kinetic equation, and the fourth example simulates the air and dielectric breakdown in high-power microwave devices by coupling electromagnetic modeling with various plasma models. With these examples, we will discuss the methodologies and some of the challenges in multiphysics modeling. As an art and science for solving Maxwell’s equations, computational electromagnetics is a fascinating area for research and engineering application. Over the past five decades, computational electromagnetics has evolved into the most important field in the general area of electromagnetics. The importance of computational electromagnetics is due to the predictive power of Maxwell’s theory – Maxwell’s theory can predict design performances or experimental outcome if Maxwell’s equations are solved correctly. Moreover, Maxwell’s theory, which governs the basic principles behind electricity, is extremely pertinent in many engineering and scientific technologies such as radar, microwave and RF engineering, remote sensing, geoelectromagnetics, bioelectromagnetics, antennas, wireless communication, optics, and high-frequency circuits. Furthermore, Maxwell’s theory is valid over a broad range of frequencies spanning static to optics, and over a wide range of length scales, from subatomic to inter-galactic. Because of this, computational electromagnetics is a very important subject which has already impacted and will continue to impact many engineering and scientific technologies. In this presentation, we will review the past progress and current status of computational electromagnetics, and discuss its future challenges and research directions. We will first give an overview of computational electromagnetics methods and then use a variety of examples to demonstrate their applications. Note: This talk is aimed at senior undergraduate and beginning graduate students.